This excursion is a walk for the reasonably fit, or for those who, without too much exertion, want to walk among the green forests for a few hours and then have a swim at the end in the translucent sea off the north-western coast of the island. Leaving Capo Sant’Andrea, at sea level, in the early morning, the walk climbs up to an old stone mule track (still in perfect condition) at La Zanca, and then path 13 is taken, which leads through one of the most beautiful forests on Elba in about 30 minutes. Continuing through secular chestnuts and other tall trees, the Sanctuary of the Madonna of the Mountain (630 m) is reached in about 2 hours. Here, there is fresh water in the fountains in the cloister and pleasant shade provided by the secular chestnut trees, black locust trees and pines surrounding the area. Optional itinerary A). The area surrounding the sanctuary is rich in archaeological findings dating back to the Bronze Age, when the area was inhabited by people from Liguria and the Apennines, who were mainly farmers. To visit these caves, dolmens and “goat pens”, the path towards the north should be taken for a few hundred metres beyond the Sanctuary, reaching the rocky complex known as “L’Aquila”. Optional itinerary B). For those who like climbing up high, the dominant peak of Monte Giove (800 m) can be reached in about 25 minutes, and is one of the most beautiful places on the western part of the island. Descending beyond the crest towards the west leads to Serraventosa, where there are rocks in the strangest and most beautiful forms imaginable, with a view out over Capo Sant’Andrea, Marciana Alta, Corsica and Capraia. A flat road leads back to the sanctuary of the Madonna of the Mountain from Serraventosa. After a rest and refreshment, the descent starts in the early afternoon, first down path 3 and then down path 13 through a large grove of chestnut trees. Once the provincial road has been reached in San Rocco, this is followed for about 1.5 km until the turning for Maciarello. From Maciarello, the descent goes through Cotoncello – Sant’Andrea (the path to Cotoncello starts on the left next to an Enel electricity cabin), where a refreshing swim awaits. For those who love nature, history and art, here is a new and exciting adventure. Archaeological walks are nothing more cultural strolls, in which the history of the area is rediscovered through the archaeology of its landscape. Capo Sant’Andrea, the north-western tip of Elba, is not only renowned for its breathtaking seabeds and its thriving forests, but also for its artistic and cultural heritage from the past. There are still visible signs here of the ancient people who lived in the area, from prehistoric times to the Greeks age. Medieval places and those from more recent times can both be seen here: fortresses, military architecture and Napoleonic residences. All the signs of a civilisation dating back thousands of years are on view. Comfortable shoes, layered clothing, a backpack for supplies and a map of the pathways is all that is needed for a journey along the ancient roads of Elba. 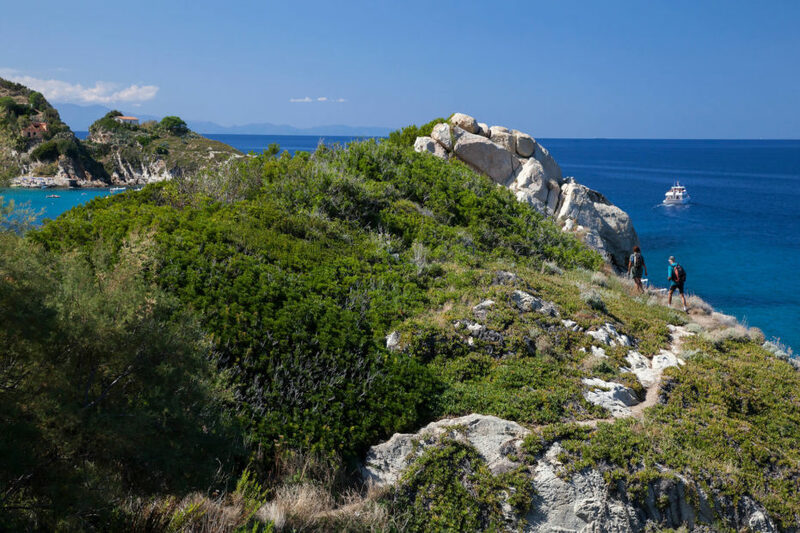 With an expert, or even alone, with an excellent guidebook at hand, one can visit the old granite mule tracks, paths immersed in the Mediterranean forest and, for the more physically fit, steep climbs up to the highest peaks on the island. One of the proposed itineraries is that from the medieval hamlet of Marciana, where the Archaeological Museum, with artefacts form prehistoric, Etruscan and Roman times, and the fortress are worth visiting, climbs up to the Sanctuary of the Madonna of the Mountain, along a route rich in historical references, mainly from Napoleonic times. Stopping here provides a dream-like view, stretching all the way to Corsica, and the possibility of a moment’s reflection in one of the chapels along the pathway like the Stations of the Cross. The Sanctuary is famous for the purity and freshness of its waters and for the finding of a fresco attributed to Il Sodoma, is located in an area rich in prehistoric heritage: dolmens, goat pens, caves and shelters used by people dedicated to farming. The more physically fit can climb up to the peak of Monte Giove (855 m), from where the most beautiful views on the island can be seen, where the rocks, carved by the wind, have taken on astonishing human forms. The itinerary is downhill from here, and leads back to the crystalline sea at Capo Sant’Andrea, on an old stone mule track. An excursion exploring the ancient roots of the mountains on Elba, from Marciana to Capo Sant’Andrea. Time: 4 hours. Departing from Marciana (350 m), from the ancient gateway to the village near the church of Santa Caterina, following the pathway marked number 3, which goes through the village in a series of stairways. There are two structures of great interest in the upper part of the village, which merit at least a brief visit: the Archaeological Museum (with exhibits form prehistoric, Etruscan and Roman times) and the Fortress. Leaving the village behind, the path to the Sanctuary of the Madonna of the Mountain (632 m) follows a paved route sloping gently upwards, flanked by the characteristic chapels marking the Stations of the Cross. The Sanctuary is rich in historical references; Napoleon Bonaparte himself stayed here in August 1814 for a secret meeting with Maria Walewska and her son Alessandro. It is said that the panoramic view to Corsica, his birthplace, was the inspiration behind his escape plan and subsequent attempt to regain power. The Sanctuary is famous for the purity and freshness of its water, and contains a fresco attributed to Il Sodoma. The area surrounding the sanctuary is rich in archaeological findings dating back to the Bronze Age, when the area was inhabited by people from Liguria and the Apennines, who were mainly farmers. To visit these caves and other constructions, including dolmens and “goat pens”, the path towards the north should be followed for a few hundred metres beyond the Sanctuary, reaching the rocky complex known as “L’Aquila”. Another interesting area for goat pens and stone shelters is that around Serraventosa (630 m), about 1 km to the west. From here, the peak of Monte Giove (855 m) is reached following a path along the ridge. Monte Giove provides some of the most spectacular views on the island, and the area is also renowned for the characteristic rocks, the forms of which seem to be human beings and animals sculpted by the wind. From Monte Giove, the descent goes back to the Sanctuary, and then path 3 is followed for about 700 metres, then path 13 until reaching the provincial road in La Zanca (150 m). From here, an ancient pathway is taken leading back to Capo Sant’Andrea (2 m). This itinerary can also be done on mountain bike, departing from and returning to Marciana. Time: 4.30 hours. Max change in level 300 m climbing. The itinerary starts from the medieval hamlet of Marciana, accessible from Capo Sant’Andrea by ATL bus. The reference point is the parish church of Santa Caterina, which leads into the small historic centre through the medieval gate of Lorena. Climbing stairways and narrow alleys characterise the start of the walk, reaching the large chestnut forest, through which the Hermitage of San Cerbone is reached in about 40 minutes walk to the south-west. It is said that San Cerbone sought refuge here in the sixth century from the hordes of Gunmarith, Duke of the Lombards. However, the small church was not built until much later (15th century). From the hermitage, a 20-25 minute climb leads to point “A”, and this bendy pathway is followed in a north-westerly direction. The path is almost flat, leading through the rocky ridges of Monte Capanne, and form time to time offering beautiful views. With a bit of luck, glimpses will be had of mountain goats or red-legged partridges scurrying among the granite rocks, or even the majestic flight of the buzzard hunting for small mammals. In spring, the perfumed flowers of the Mediterranean forest can be admired, while beautiful stretches of orchids and violets in the fields and on the rocks provide an unusual colour to the countryside. Valle di Pedalata is reached after about one hours walk, and from here, crossing a forest of pine and chestnut trees, point “B” is reached. A short climb leads up to “La Stretta”, a small ridge from which on clear days Corsica and Capraia can be seen to the west and central-eastern Elba to the east. On the return leg, before ending the excursion, it is worth stopping to visit the imposing Fortress (built by the Pisans in the 12th century), and a short distance away, still in the upper part of the historic centre of Marciana, the Antiquarium, the first archaeological museum on Elba, where interesting exhibits from the Bronze, Etruscan and Roman ages are to be seen, and a small botanical garden. An attractive itinerary in the mountains to admire the rich fauna on Elba. Time: 5.30 hours. Departing from the square in Pomonte (30 m) and, facing the mountain, walking up to the left on path 4, which crosses the left hand side of the valley. The path, which climbs up the mountainside between terraces, some of them still cultivated, is the old mule track leading from Pomonte to Marciana. After about an hour, the locality called “La Terra” (550 m), a high plain with wide flat areas, is reached. This area was inhabited until early in the last century, and there are still remains of the ancient settlements and of two churches: that of San Bartolomeo, on the rocky divide between the Pomonte and Chiessi valleys, and that of San Sebastiano, about two kilometres further north, above the path which continues on to the Sanctuary of the Madonna of the Mountain. Turning off path 4 onto path 10 to reach the ridge on the Monte Capanne range in the Tabella – Monte di Cote area (900 m), the descent goes down through “La Stretta”, where path 54 is crossed, which leads to the road joining Marciana (370 m) and the Sanctuary of the Madonna of the Mountain, from where there is a quick descent to the village, where the walk ends. Predators and birds of various species can be seen in flight along the whole itinerary, according to the season. Elba is an excellent place for the migratory birds in the northern Tyrrhenian to stop and seek refuge. The native wildlife includes the red-legged partridge, buzzards, the common kestrel and the northern goshawk, the dormouse, hare, wild boar, martens and mountain goats, which are the most spectacular animals to encounter, but must be approached quietly and from downwind. Mountain goats are a common sight in the area around the Pomonte valley, while “La Stretta” is the best place for bird watching, as it is an obligatory passage from the western valleys to the wide valley of Marciana.